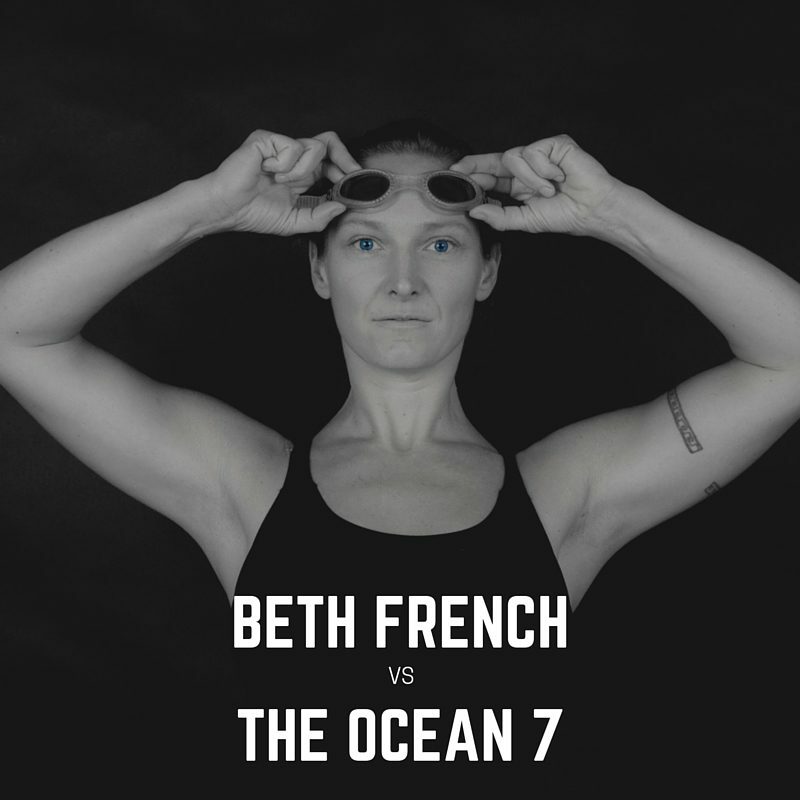 Swimmer Beth French is going to take on arguably the toughest swimming challenge on the planet, the Ocean 7. The Ocean 7 forces swimmers to cross seven sea channels, which have been selected by the World Open Water Swimming Association to push any endurance swimmer to their absolute limits. Tackling the Oceans 7 means dealing with vicious currents, frigid temperatures and nerve wracking wildlife encounters. To date only six people have completed all seven swims in their lifetime. Beth is going to take on the whole list in a single year, the swimming equivalent of mountaineering seven summits. There is no wetsuit and no physical assistance – just Beth, and the elements. North Channel – Ireland to Scotland. Distance approx 18miles, average temp 14°c. Challenges: Strong currents, cold temperatures, rough seas, jellyfish, strong tides and fickle weather. Distance approx 21miles, 22°c dropping to 14°c for the last 3miles. Challenges: Strong currents, abundant shark life. Molokai Channel (kaiwi) – Hawaii. Distance approx 28miles, 24°c water. Challenges: Strong Pacific current and swells, abundant wildlife, energy sapping warm water. Cook straits – New Zealand. Distance approx 21miles, 16°c water. Challenges: Rough seas, strong winds, abundant wildlife. Straits of Gibraltar – Spain to Morocco. Distance approx 10miles, 16°c water. Challenges: busy shipping lane, possible great whites. Distance approx 18miles, 16°c water. Challenges: Very strong currents, busy shipping lane strong winds, rough seas, abundant wildlife. Distance approx 22miles, 16°c water. Challenges: Very strong tides, strong currents, cold water, very busy shipping lane. Each of these swims is a major feat in itself. Some have only ever successfully been achieved by a small handful of swimmers. Attempting all seven in a single year will test the limit of what is currently believed physically possible in terms of endurance and recovery. We got the chance to chat with Beth about her upcoming challenge, here’s what she had to say. For those who haven’t heard of Beth French, can you tell us a little bit about yourself? I’m a self employed single mother who home-schools her son with special needs and sea swims for sanity….. I’m hooked on exploring potential and the connection we have with our dreams and goals- and the mechanics of building them into our daily lives. I had my future wiped out by being ill from the age of 10 yrs old with no end in sight- winding up in a wheel chair at 17. I had to relearn everything from walking to who I was and how to work my body. To date, I have swum the English Channel, I became the first British woman to swim the Molokai channel- swimming non-stop for 24hrs 10mins; then I became the first person ever to swim from Cornwall to the Isles of Scilly. So clearly you are an accomplished swimmer, where did this passion for swimming come from? I was a toddler who would take her nappy of to climb in a bucket of water, or flop in a puddle. Water is where the world makes sense to me. Being face down in water for hours at end, without the restriction of lanes and turning around at the end of a pool is so freeing- it’s cathartic and meditative. You get to communicate so closely between body and mind and it’s a perfect crucible to hash out your demons and explore your inner landscape. When you’re out swimming and you hit ‘The wall’, where do you pull your motivation from? There are 2 things to recognise here- with ocean swimming, there is no 1 ‘wall’ – you hit a wall every hour or so, after about 6hrs if you are lucky enough to have avoided them that far. The other is that you discover there is no 1 motivation. I was surprised by my motivation come the ‘wall’ near the end of the English Channel. I had gone through the usual- making people proud who were rooting for me, showing those that thought I couldn’t they were wrong, even making my son proud. None of those really worked for me. Letting go of whatever was holding me back, whatever bit of my personality that told me I couldn’t take another step- that worked. And eventually, it was all about fitting swimming the English Channel into my daily life- I realised I could swim to France and be back in time to put my son to bed…. That got me shifting! So when I walked up onto french shore, I became my own hero by high tailing it back in time to be a regular mum as well. Meditation. I ordained as a buddhist monk in Thailand in 2001 and studied intensive meditation practice. It has made it over to the west as mindfulness. Being present in all areas of your body, so you can utilise every bit of strength and energy is vital. So, yoga/Pilates is also a major part of that conversation. Looking back, is there one piece of advice that someone has given you that you would consider crucial to your success? Two pieces of advice I live by. When I was in a wheelchair, I was taken to a therapist to try and get some relief. He told me that only I was responsible for how I felt, and I had to take control of my life – he told me I would hate him for saying it, but that I was the only one who had the right and ability to affect my internal world. If I could start to manage that, then I could change whatever I wanted about what worked or not for me. The other piece of advice was given to me years later- ‘inch by inch, life’s a cinch.’ Take each and everything one step at a time- that way you don’t get overwhelmed and can accomplish so much. It also teaches patience! Your story is an inspiration to many when to comes to pushing the boundaries of what is possible. Is there any particular athlete or person you look up to for inspiration? When I was younger, Martina Navratilova was a huge influence. She was a lefty, and there weren’t many of those about… and broke boundaries between the sexes. She was compared to men in a very divided world and I remember feeling that there were ways that we could be seen as equals physically. Very inspiring to a tom boy. Lewis Pugh has made me realise that perceived limitations are merely proscribed possibilities. Preparation and daring to try change the world everyday. After you have finished the Oceans 7, have you got an eye on the next big challenge? What’s next? This oceans 7 project is going to throw my daily routine out the window, so I am fascinated to see what happens afterwards. One of the things I am looking forward to is the fact that Dylan, my son will be old enough to take part in more climbing activities- as much as water is where the world makes sense to me, hanging off a vertical surface is where he feels at home. He’s exceptional and I’m looking forward to terrifying myself by giving him more opportunities to scale random objects. Where about’s can we track your progress? You can also donate to my Crowdfunding campaign at www.crowdfunder.co.uk/oceans7 where donations are greatly appreciated!